Waiouru: Are we there yet? Question from Jan at the tail end of a long day cruising! 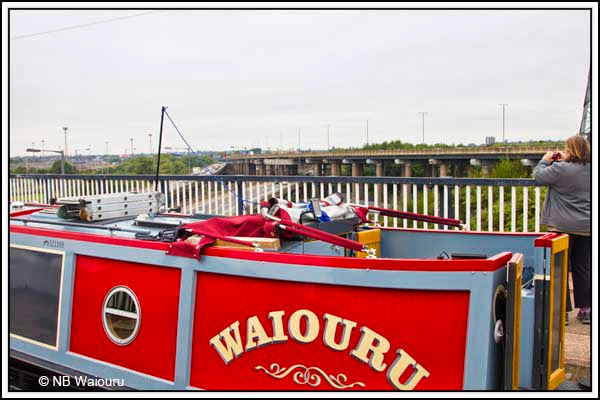 Not wanting to disturb the neighbours I bow hauled Waiouru to the water point at the top of the Rushall Flight of locks at Longwood Junction. This is the first of the new stainless steel water point stands we have seen and I’m not very impressed. I had difficulty unlocking the top padlock with our BW key and then discovered the bottom compartment also had to be unlocked to turn on the secondary tap. The stand didn’t appear to be very robust and I suspect they will never have the life expectancy of the old cast iron stands. 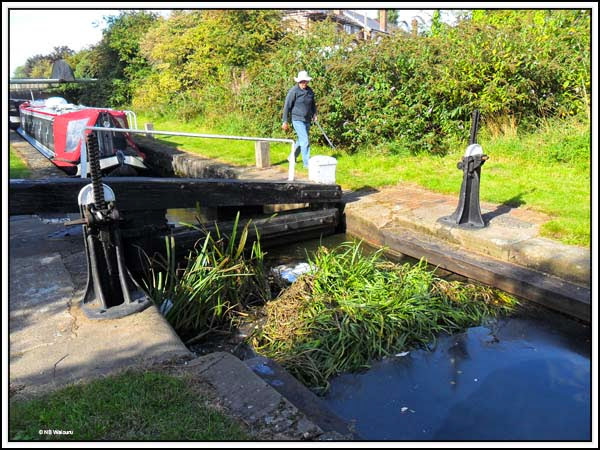 We were warned by a local we might experience problems with some of the lock mitre gates not remaining open and it did happen twice. 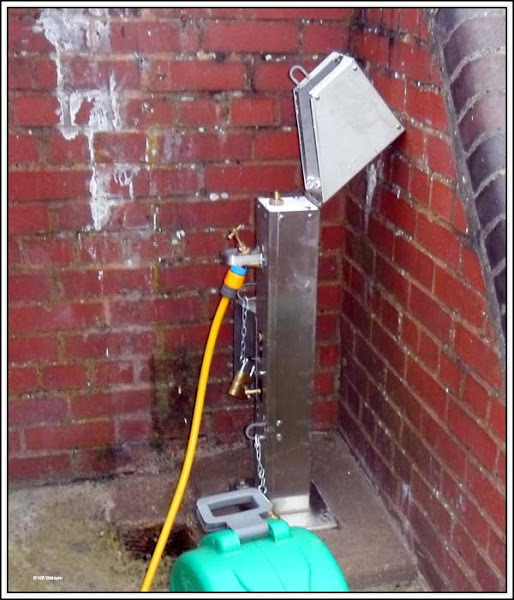 Our remedy was to use one of the centrelines around the gate beams as shown in the following photo. The photo is blurred but you can see the method. The Rushall Branch was full of weed and not all that deep. However there were a couple of compensations. 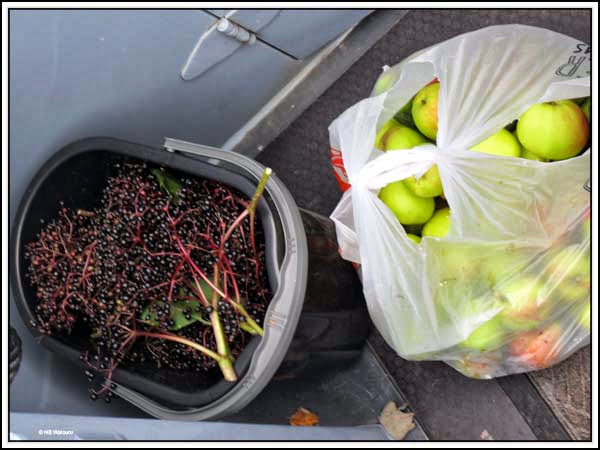 At <censored> lock on the offside there was an apple tree heavily laden and the towpath slide had numerous ripe elderberries. The canal was very quiet so we stopped and picked both. 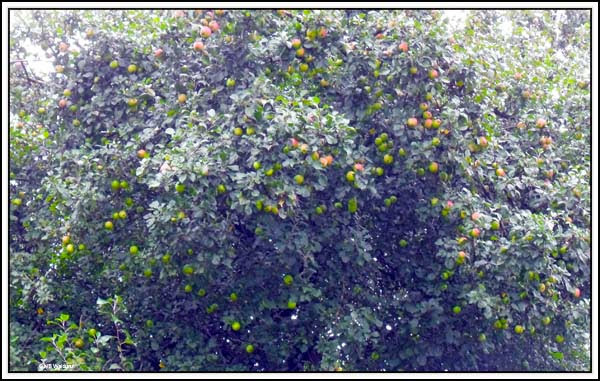 The boat hook proved very useful when pulling some of the apples from the tree. My stomach tells me elderberry and apple pie might be on the menu! Cruising speed increased when we turned right onto the Tame Valley Canal. Like the Rushall, it has some long straight sections. The first long section became a high embankment enabling us to look down into the valley on the port (left) side. The River Tame and the M5 motorway are down there somewhere. Ahead we could see an aqueduct. There was no boating traffic so we stopped on it for a photo opportunity. 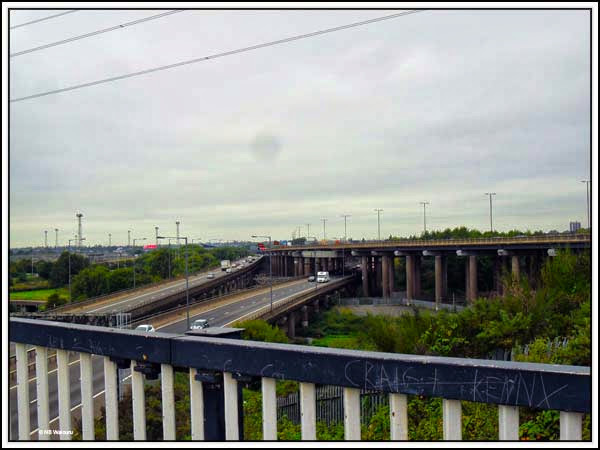 The M5 and M6 motorways. 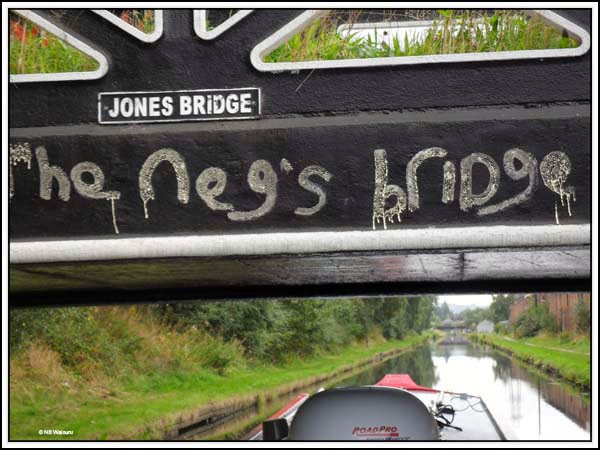 We’ve used both and never realised the canal was so close. 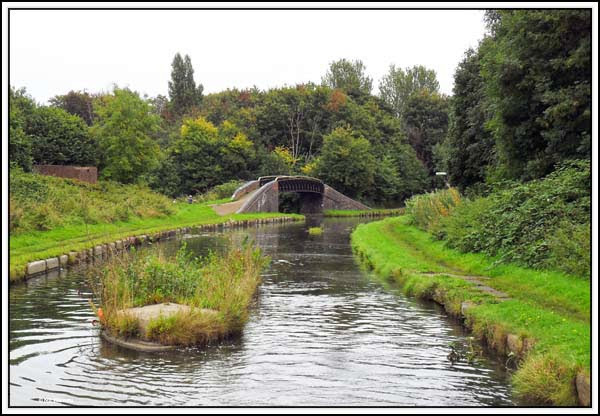 The canal then moved from an embankment to a cutting. Towards the end there was a very important bridge. 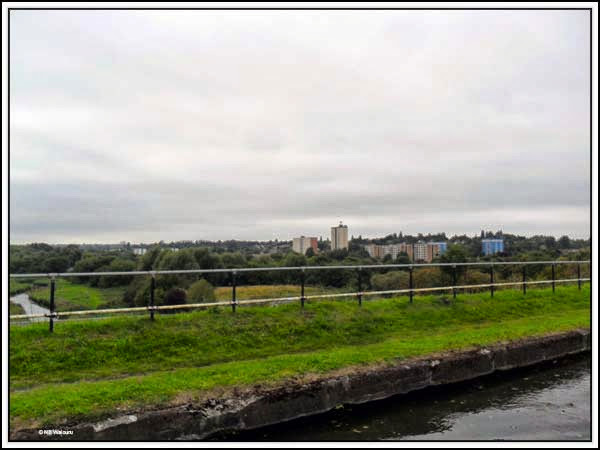 Eventually the canal terminated at Tame Valley Junction where we turned left onto the lower section of the Walsall Canal <YUK!>. Shallow and filthy. It was a slow cruise at tick-over getting to Ryder Green Locks. Waiouru rode over three submerged obstacles in the second pound which made me quite nervous. The locks (all 8) were heavy and full of rubbish. Jan couldn’t open the top gate as two large clumps of thick grass/reed were obstructing it. 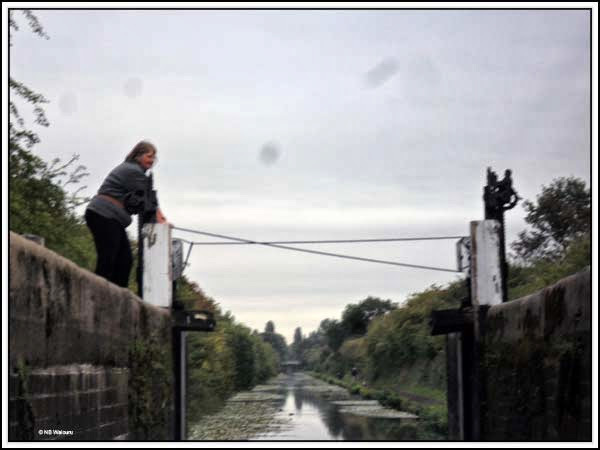 She managed to enlist the help of a fat elderly man who used his boat pole to pull them away from the gate. It was another slow slog until Pudding Green Junction was reached and we joined the BCN New Main Line. Waiouru felt like it was pulling a parachute and I was eventually forced to go down the weed hatch and remove some rope from around the propeller. 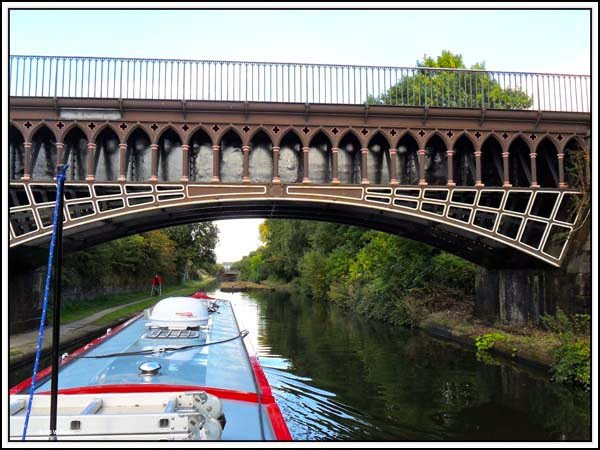 After that we made reasonably good time passing under the aqueduct that carries the canal to the Engine Arm. Two skeletal arches with a trough fixed between them. 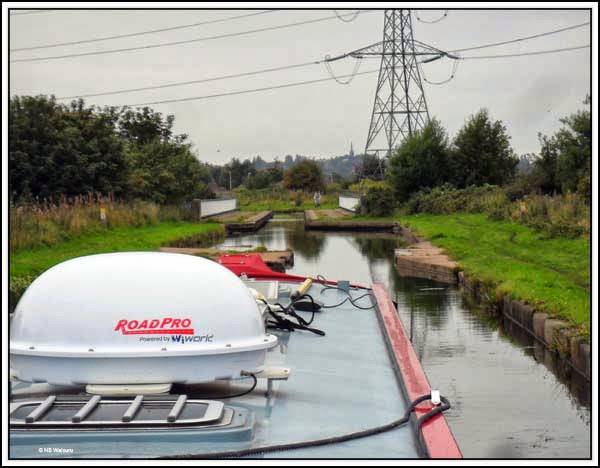 On rounding a bend we saw another boat ahead of us that was actually moving (first in two days), however they turned off at the Soho Loop whilst we carried on to Ladywood Junction in the centre of Birmingham where we found a vacant 48 hour mooring. It’s been a long day so tomorrow we’ll have a rest and Jan can look forward to a Sunday pub roast lunch. We might even try some retail therapy!